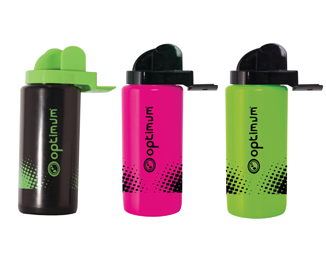 Optimum’s bestselling Aqua Spray Water Bottle is here in a choice of three colours, Fluro Green/Black, Black/Fluro Yellow and Neon Pink/Black. Supplied in a one litre capacity and featuring a no contact outlet nozzle, this bottle is designed to reduce cross contamination when sharing team bottles. Configuration aligned outlet hose to make hydration easier.